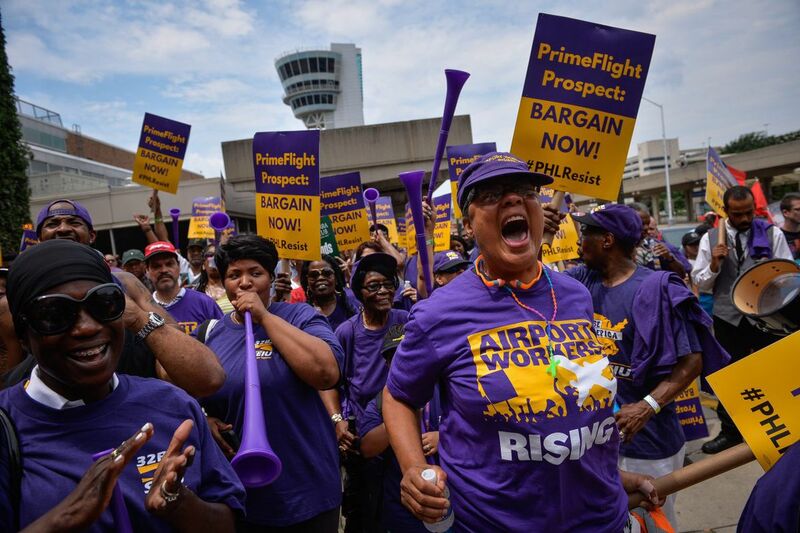 Philadelphia International Airport workers, part of the 32BJ labor union, marched outside of Terminal B/C to demand a contract with American Airlines subcontractors PrimeFlight and Prospect, at PHL International in July. Airline contractors at Philadelphia International Airport have agreed to bargain collectively with the Service Employees International Union Local 32BJ a contract for about 1,400 passenger service workers, after four years and numerous protests. The workers voted overwhelmingly in April to join the SEIU, but their employers, subcontractors hired by various airlines, had refused to negotiate. The bag handlers, wheelchair attendants, aircraft cabin cleaners, and sky caps threatened a walkout last month, when American Airlines stepped in to smooth the way. American's vice president of government and airport affairs, Michael Minerva, joined Mayor Kenney and leaders of SEIU 32BJ in City Hall Tuesday to announce a landmark agreement between the SEIU and the contractors, PrimeFlight Aviation and Prospect Airport Services. Mayor Kenney, who has supported the airport workers cause, said, "Let's be clear, folks who work at the airport, one of the biggest economic engines in the city, should not be struggling to get by. The workers at SEIU are to be congratulated for getting us to this day where these workers have the right to collectively bargain for their wages, working conditions, and other benefits." Minerva said American Airlines "believes very strongly in the collective-bargaining process. This is something we are very comfortable with, and very familiar with at American Airlines. The overwhelming majority of our employees are represented by unions. I want to thank everyone whose energy and efforts brought us to this day where we can close the chapter on some of the unrest and unhappiness that's prevailed at times and now we'll move forward together." The secret-ballot National Labor Relations Board (NLRB) election in April was heavily in favor of joining the nation's largest property-service workers union. Hector Figueroa, president of SEIU 32BJ, and Gabe Morgan, vice president of SEIU 32BJ, were also on hand Tuesday to celebrate what they called a path forward for good jobs for the PHL airport workers. "Today is a great day for airport workers at Philadelphia International," said Alfred Williams, a baggage handler. "Many of us have been fighting for this four years or longer. Now all our hard work has finally paid off." Philadelphia International has 20,000 employees who wear badges and work inside airport security as maintenance, janitors, and other employees who work directly for airlines. Most belong to labor unions. But a group of employees who worked for tips, such as sky caps, baggage handlers at the luggage carousels, aircraft cabin cleaners, and wheelchair attendants, fought for years to get better wages. Beginning July 1, 2015, these workers won an agreement with the city to be paid $12 an hour, in keeping with a "living wage" standard approved by Philadelphia voters in May 2014. Before that, they earned as little as $7.75 an hour plus tips. Since then, the workers had demanded $15 an hour, and threatened to strike ahead of the Democratic National Convention last July to protest unfair labor practices and low wages.